Barry Bonds and Roger Clemens, who would have been elected overwhelmingly if it weren’t for their well-documented links to performance-enhancing drugs, received 36.2 and 37.6 percent of the vote, respectively, roughly half the 75 percent required for election. The 200-plus writers who voted for them (out of 569 ballots cast) and many others argue that a Hall of Fame without two of the best players in history would be a joke. Like it or not, this debate has barely started. 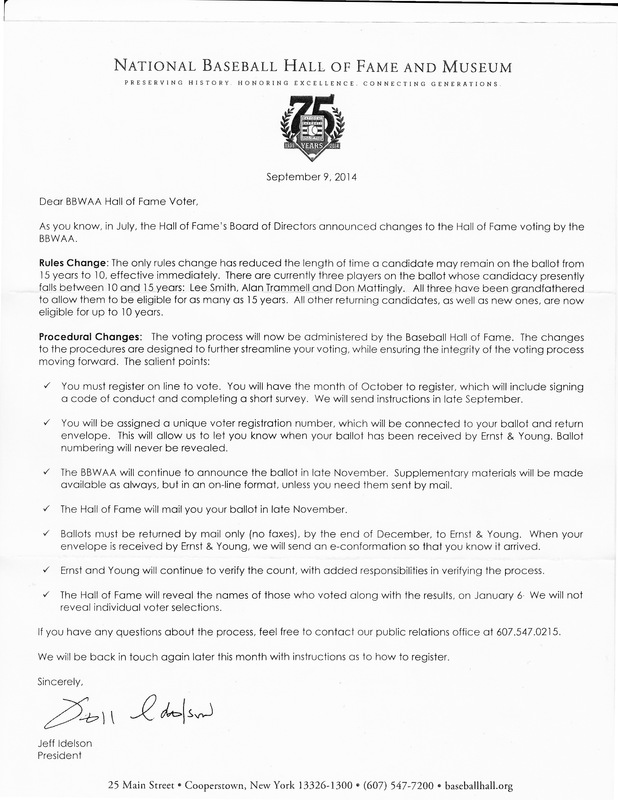 Bonds and Clemens will be on the ballot again next year, and the year after that. The issue will be revisited annually until they are elected or fifteen years have passed, whichever comes first. But the argument that their numbers are so big they must be accepted no matter how they were achieved stands in stark contrast to the fate of Lance Armstrong’s unprecedented achievements in cycling, which have been eviscerated in the wake of findings by the U.S. Anti-Doping Agency that he engaged in a sophisticated doping program. Baseball has no such independent watchdog. Instead, it belatedly developed an in-house drug testing program after its principals — commissioner Bud Selig and then-players’ association chief Donald Fehr — were embarrassed in a public hearing before Congress. As a result, the sport and many of its apologists have developed a lengthy series of rationalizations for giving up on any attempt to make the distinctions among accomplishments that are standard procedure for sports that fall under international rules and the Olympic umbrella. But baseball still has a big problem — the apparently universal antipathy for steroid users among existing Hall-of-Famers. If the argument takes hold that a credible Hall must include Bonds and Clemens, Cooperstown will face the threat of a boycott by its most cherished constituency — those already enshrined there. One of the most outspoken is Colorado’s Goose Gossage, the power relief pitcher inducted in 2008, but a number of others have made their views known as well. In the wake of this year’s balloting, I asked Gossage what he thought existing Hall-of-Famers would do if Bonds or Clemens or both are eventually elected. “I didn’t make it there last year, it’s the only year that I’ve missed since I got elected, but they had some discussion last year, and as I understand, there were a lot of guys that said they would not come back to the Hall of Fame,” Gossage said. In addition to the substantial minority of veteran writers that voted for Bonds and Clemens, many critics of the BBWAA say any attempt to exclude steroid users is an exercise in sanctimony. Baseball abided a pervasive culture of permissiveness during the steroid era and there’s no undoing it now, they say. Existing Hall-of-Famers do not share this sentiment, at least in part because many of their accomplishments pale in comparison to the steroid-fed numbers put up by some of the leading suspects. “There are those writers that think cheating is OK,” Gossage said. “We’re going to reward these guys? The last paddle that we have for these guys’ asses is an election to the Hall of Fame. They’re laughing all the way to the bank. They cheated. They, meaning Bonds and (Mark) McGwire, they broke two of the most sacred records that baseball has had, and that’s the (career) home run champion, which was Henry Aaron — and in my eyes Henry is still the home run king — and Roger Maris’ sacred record of 61 home runs (in a season), and McGwire broke that. Gossage thinks baseball’s current system of testing and punishment is still too lenient. He cited Melky Cabrera, the most valuable player in last year’s All-Star Game who was batting .346 for the Giants when he tested positive for performance-enhancing drugs and was suspended for 50 games. The Giants had only 45 games remaining when Cabrera was suspended and cut ties with him. As a Hall of Fame voter, I made a distinction between players linked to steroids by substantial evidence in the public domain and players linked to PEDs merely by rumor. I asked Gossage how he believes writers should treat this latter group, which included Jeff Bagwell and Mike Piazza on this year’s ballot. Both of them did substantially better (59.6 and 57.8 percent of the vote, respectively) than Bonds, Clemens, McGwire, Sammy Sosa or Rafael Palmeiro, all of whom have been linked to steroids by evidence of one sort or another. “Other than Clemens and Bonds, because we know that they did, Sosa, all of a sudden he goes to Congress and he can’t speak English,” Gossage said. “I think that these guys where there are innuendoes, there’s talk, whispers of these guys taking performance-enhancing drugs, I think if there is nothing directly linking them to them, I think you’ve got to vote with your heart and if they’ve got the stats, they should be in the Hall of Fame. Among both the public and the writers, outrage over baseball’s steroid era is dissipating. The belief that a Hall of Fame without Bonds and Clemens is somehow invalid could continue to gain traction over the coming years. But there is no sign yet that this view is making much progress among those already enshrined. Until it does, the election of a known steroid user such as Bonds or Clemens would likely create a major fissure within the Hall of Fame itself.